Artful view of Book Inc.
Every bookstore has character. That’s what engages or deters customers from frequent visitation. Some are polished formal affairs that feel like a museum or perhaps an art gallery—look but don’t touch. While others may be rustic family affairs where the shopkeepers are boisterous, compelling visitors to engage them in the news of the day or talk about favorite books and authors. Then there are the places where the shopkeeper responds with grunts to give clear directions of book availability and to make change. Along with the people, the books and store structure add to that character. I’m John McCarthy, and I’m a Bookstore Ethnographer. I travel to many places for my work of Education Consulting. During my “free” time, I love to visit bookstores, where other travelers might find the local pub, golf course, restaurant, or beach. These posts are not intended as reviews. I am a social activist who speaks on behalf of the books. My intention is to capture the character of each store, which is shaped by the selection and care of books by the shopkeepers and the store structure. Follow my Pinterest board for pictures of the stores I visit and follow me on Twitter for more about my work in Education, Bookstore Ethnography, and other articles. Share your bookstores by comment below or a tweet to @jmccarthyeds. If I’m in the area, I will very likely visit. A block from the bookstore is an Apple Store, where I stopped to get help with my laptop. The area is filled with shopping and restaurants in what appears to be an affluent neighborhood. Parking close by offers 2 hours of free parking, where I was lucky to find someone just leaving a spot. 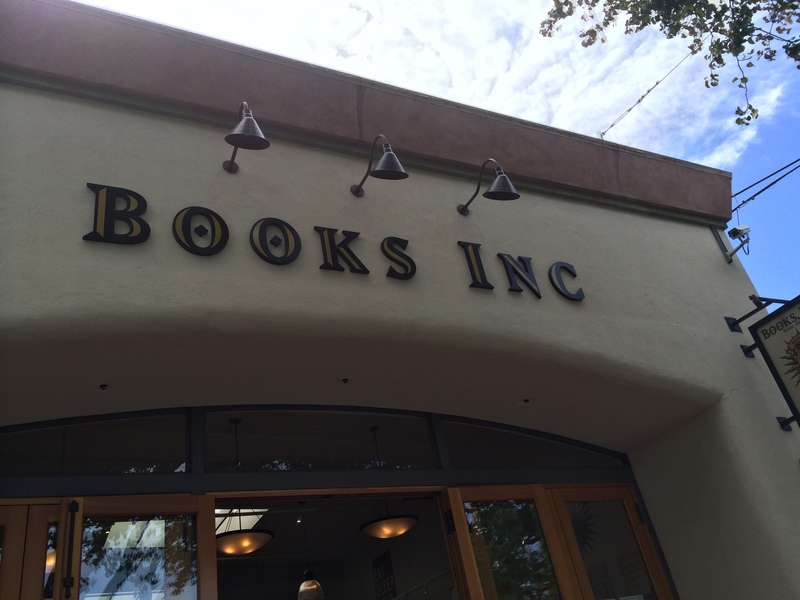 The front of Book Inc. reminded me of an art gallery store front with large windows and stone stairs up to a common porch with other stores. Inside, the single room is deep, well lit, and showcases a pristine set up of bookshelves and open lanes to any section of the store. Every genre is represented with new books in tightly fitted shelving. 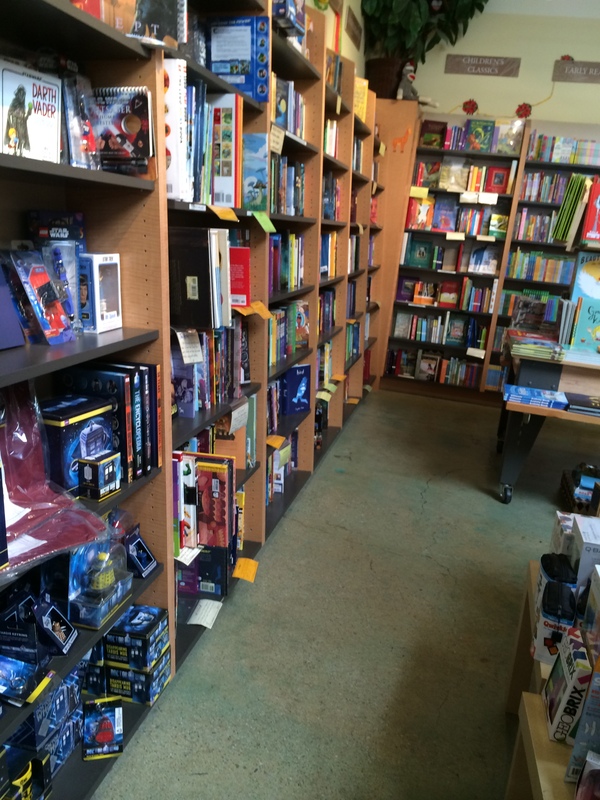 The selection for each genre is modest, which may be due to the size of the store. You can find anything that’s current, with little from past decades except for classics. Like some bookstores, there are staff recommendation cards posted by books or author series that share why customers might take a chance on such a purchase. What I found unique to my travels were the reviews posted by customers. 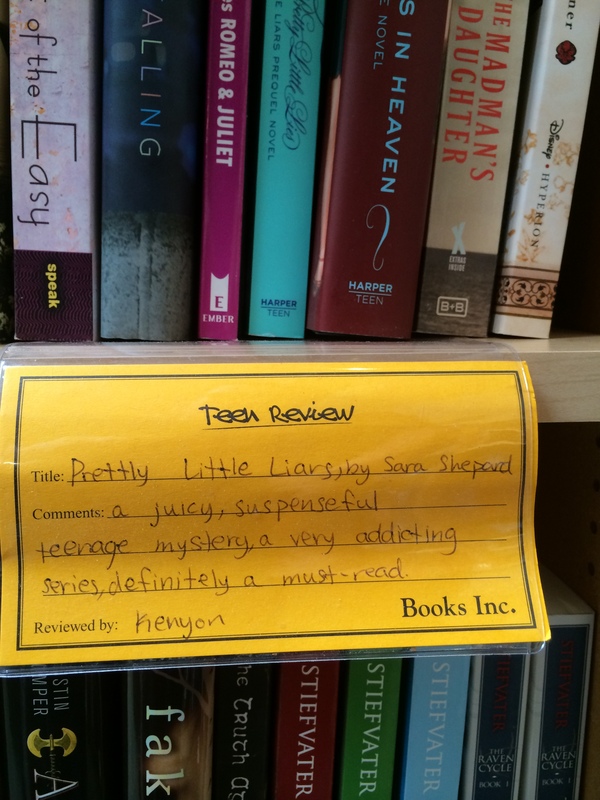 The store keeps a basket of index cards, and encourages customers to write their own book reviews. There was one by a high school student whose review was for a YA novel. It makes good business sense to invite these comments, like we find on Amazon and other places. I wonder why I have not seen this great strategy in other bookstores? Several employees talked to each other about book related stuff, looking busy as they went about their responsibilities. I walked up and down the store several times without being approached for offered assistance. Maybe I looked like I was zeroed into the books, which would be better than the alternatives. The conversations was business, like you would find at many non-bookstores. Perhaps this is because of the touristy nature of the area? Hard to say from a 25 minute visit. The time was well spent in an artful-looking bookstore. I know the area. Never saw the book store before. I’ll look for it next time. The Big Box Bookstore model in this country has tried, and for the most part failed, to provide their area’s local authors much in the way of promotion and exposure. They count the “shelf life” of a new book in weeks not months or years, and unsold inventory is sent back to the dark, cold warehouse. Gone is any and all further exposure. Cut roses live longer than most new books, if you are not already an established name on a national scale. The decision to pull the inventory isn’t being made by the local store any more, but by the parent corporation in a top down fashion. Until there is a renewed effort to promote writing, reading and local authors from the bottom up, where the local store manager says what stays and what goes, who gets what shelf space and posters on the door, the deep discounts, the fan clubs, etc… Until those kinds of decisions are made at the local level, e-publishing is going to continue to eat print for lunch. If you’re in Detroit, MI–John K. King Used & Rare Books in downtown Detroit is open Mon-Sat 9:30am – 5:30pm. I love the store in Downtown Detroit. I hope it’s around for many more years.